Mosquitoes themselves aren’t very dangerous, but they act as a vector for many disease-causing viruses and parasites such as yellow fever, dengue fever, Chikungunya, malaria, Tularemia and more. Mosquitoes are estimated to transmit various types of disease to more than 700 million people annually with at least two millions of resultant deaths. Thus becoming the deadliest animal to humans. Though not all snakes are dangerous, many of them are. More than 450 species are venomous, and 250 are capable of killing a person. The Echis (a genus of venomous vipers) causes most of the snakebite deaths worldwide. Its poison can keep the victim’s blood from coagulating, and the person can bleed to death. All known scorpion species possess venom, but only 25 have venom that is deadly to humans. However, all scorpions are able to penetrate human skin and deliver sharp, unpleasant stings, most of which usually leave redness around the stung area. 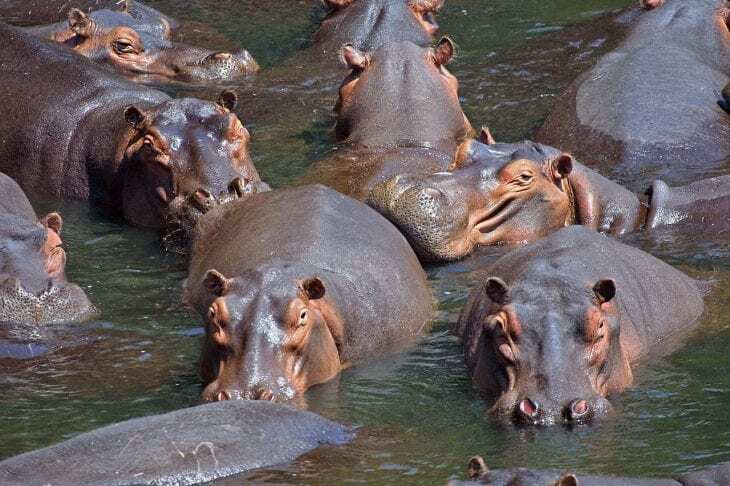 Hippos are very aggressive towards humans, whom they commonly attack whether in boats or on land with no apparent provocation. They are widely considered to be one of the most dangerous large animals in Africa. The larger species of crocodiles are very dangerous to humans, mainly because of their ability to strike before the person can react. The saltwater crocodile and Nile crocodile are the most dangerous, killing hundreds of people each year in parts of Southeast Asia and Africa. The mugger crocodile, American crocodile, American alligator and black caiman are also dangerous to humans. More than any documented attack, Peter Benchley‘s best-selling novel Jaws and the subsequent 1975 film adaptation directed by Steven Spielberg provided the great white shark with the image of being a “man-eater”. The great white shark is one of only four kinds of sharks that have been involved in a significant number of fatal unprovoked attacks on humans and since 1990, there have been a total of 139 unprovoked great white shark attacks, 29 fatal. Unlike the smaller black bears, adult grizzlies are too large to escape danger by climbing trees, so they respond to danger by standing their ground and warding off their attackers. Grizzly bears normally avoid contact with people. Most grizzly bear attacks result from a bear that has been surprised at very close range, especially if it has a supply of food to protect, or female grizzlies protecting their offspring. In such situations, a property may be damaged and the bear may physically harm the person. While lions do not usually hunt people, some (usually males) seem to seek out human prey; well-publicized cases include the Tsavo maneaters, where 28 officially recorded railway workers were taken by lions over nine months in Kenya in 1898, and the 1991 Mfuwe man-eater, which killed six people in Zambia. The “All-Africa” record of man-eating is considered to be incidents in the early 1930s through the late 1940s in what was then Tanganyika (now Tanzania). George Rushby, game warden and professional hunter, eventually dispatched the pride, which over three generations is thought to have killed and eaten 1,500 to 2,000 people. Elephants can exhibit aggressive behavior and engage in destructive actions against humans. In India, male elephants regularly enter villages at night, destroying homes and killing people. Elephants killed around 300 people between 2000 and 2004 in Jharkhand, India, while in Assam, India 239 people were reportedly killed between 2001 and 2006. A few species in the class of Box Jellyfish have been confirmed to be involved in human deaths. Research show that the venom of a specific specie can cause a human to collapse and die as quickly as within 2 to 5 minutes. The specie C. fleckeri has caused at least 64 deaths since the first report in 1883. In parts of the Malay Archipelago, the number of lethal cases is far higher (in the Philippines alone, an estimated 20-40 die annually from Chirodropid stings), likely due to limited access to medical facilities and antivenom, and the fact that many Australian beaches are enclosed in nets and have vinegar placed in prominent positions allowing for rapid first aid. Ha ha ha….. mosquito is first on the list !! Great information, we have to beware of this animal according to your list. Thanks for the crystal images. It is what the mosquito is capable of spreading, by way of epidemic, etc. Mosquitoes are the most dangerous animals. You should have also included ants since they can kill elephants, not knowing whether ants are animals or insects. Here’s a visualization of the number of deaths in the US per year by animal type.